Garry Monk took over as Swansea manager after the departure of Michael Laudrup in February 2014. 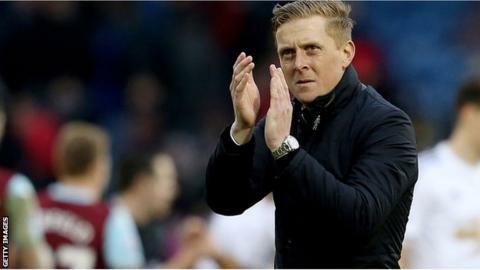 Manager Garry Monk says Swansea are not in a position to chase a Europa League place this season. The seventh placed club - currently Southampton - will qualify for Europe if Arsenal win the FA Cup and claim a Champions League place by finishing in the top four in the Premier League. Swansea are eighth, nine points behind the Saints, but Monk's focus is on beating Newcastle on Saturday. "It's a big points gap, the odds are against us achieving that," he said. "I'm not focused on that - if it comes great, if it doesn't it's not something that I'm really pushing for." Garry Monk (L) was club captain when Swansea qualified for the Europa League by winning the Capital One Cup in 2013, though Ashley Williams (R) led the team in the final. Monk does believe the club are capable of reaching European competition in future if they can continue their current level of progression. Swansea played in the Europa League in 2013-14 season after winning the 2013 Capital One Cup, but have never qualified though their league position. "The infrastructure of the club has to improve, which we are doing slowly but surely," he added. "We're getting there but it does take time. "The Squad itself needs to be added to. We're very thin on the ground . . . now with injuries to three or four key players. "Although we have good players, the depth behind isn't particularly strong. "It's something I've talked about with the chairman on the recruitment side of things so it's something we need to address going forward. "But right now can we really compete with them? [Southampton and Spurs], probably not. "But if we can continue to progress like we have been doing then it's a target we can hopefully get to in the future." Monk has no fresh injury concerns for the weekend. Defender Kyle Bartley is fit to start after appearing on the bench last week, while striker Bafetimbi Gomis remains on course to return in a few weeks.